Wightlink’s new £30million flagship Victoria of Wight is on her way to the Solent to join the rest of the company’s fleet. 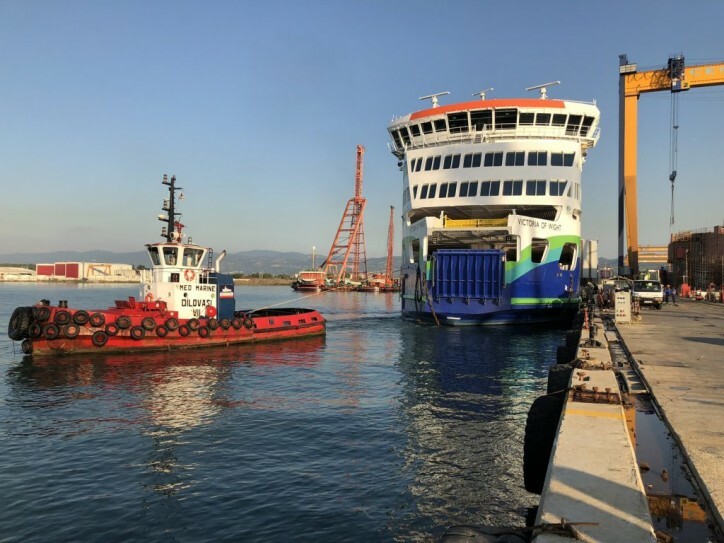 The environmentally friendly hybrid energy ferry departed from the Cemre shipyard in Yalova, Turkey on Monday 16 July at 20:00 for the 3,019 nautical mile journey to Portsmouth. She is being towed by the specialist tug Amber II through the Sea of Marmara, past Gallipoli through the Dardanelles, then westward through the Mediterranean passing Greece, Sicily and Spain before turning north at Gibraltar to sail along the Portuguese coast, across the Bay of Biscay and into the Channel. The trip should take 17 days if weather conditions are favourable. Victoria of Wight has been specifically designed and built to serve the Isle of Wight on the Portsmouth – Fishbourne route. The ship does not have cabins onboard because Wightlink crew work daily shifts and go home at the end of each shift. Because she has no cabins to allow a delivery crew to sleep onboard, she will be towed back to the Solent by a specialist towage company who have experience of delivering many ships from the Sea of Marmara to northern Europe. “We are delighted to announce Victoria of Wight is on her way home,” says Wightlink Chief Executive Keith Greenfield. “This is the final stage of our £45million investment in the Portsmouth – Fishbourne route and we look forward to introducing her to our staff and customers this summer. The new ship has room for up to 178 cars and more than 1,000 passengers. Powered by hybrid energy, Victoria of Wight will be quieter and with fewer emissions than other vessels. When she arrives in the Solent, Victoria of Wight will be made ready to enter the fleet, stocked with catering and other supplies and crews will be trained to operate her. Wightlink expects the ship to enter service this summer.